This picture came to my facebook news feed via the page of a friend. 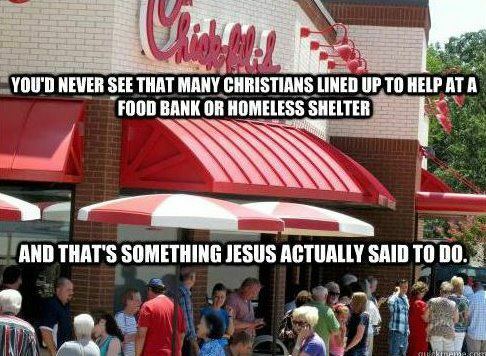 This is the kind of thing Christians come to expect when political beliefs clash. When anger flows; when people feel threatened; it is easy to find an enemy, create a hyperbole, and prop up your own beliefs with a strange sense of self-righteousness. I see it practiced by both sides of nearly every issue. Regardless of who does it, the liberal or conservative, the believer or atheist, such actions feed the work of evil. These create-an-enemy practices keep us from seeing the truth in any situation. They keep us from seeing each other and who we really are. For me the obscured truth of this picture has nothing to do with marriage, or corporations, or chicken sandwiches. It has, instead, everything to do with Jesus. We are not called Christian because of our behavior. We are not called Christians because of our political beliefs, our values or our actions. We can’t even find agreement on which politics, values and actions are Christian. Believe me; I know that Christians are often a disappointment. We are often bigots, haters, uncaring, lazy and selfish. We are, after all, sinners in a sinful world; being Christian doesn’t make us any less so. We are not called Christian because we do good works. Our God tells us that good works are impossible for us. We are not called Christian because of our behavior; we are Christians because of what God did for us. We are Christian because we know, but do not quite understand, that our Heavenly Father gave His one and only Son to die for us. We are Christian because that Son lived a perfect life and died a perfectly horrible death for us. We are Christian because Jesus defeated death, rose again, and prepares a home for us with Him. We are Christian because we are washed clean in the waters of our baptism. We are Christian because we are forgiven and loved. We are called Christians because of what Christ did for us, and for you. We fall into these traps of division and labeling because we fail to heed the advice of both Jesus and St. Paul. 3 Why do you see the speck that is in your brother's eye, but do not notice the log that is in your own eye? 4 Or how can you say to your brother, ‘Let me take the speck out of your eye,’ when there is the log in your own eye? 5 You hypocrite, first take the log out of your own eye, and then you will see clearly to take the speck out of your brother's eye. If we would each look in the mirror and realize the person looking back at us is the foremost of sinners, we would find it more difficult to condemn others and easier to humbly approach our Lord seeking the forgiveness we need so badly. Thank you, Terry. I need to send these to you ahead of time to get your additions.